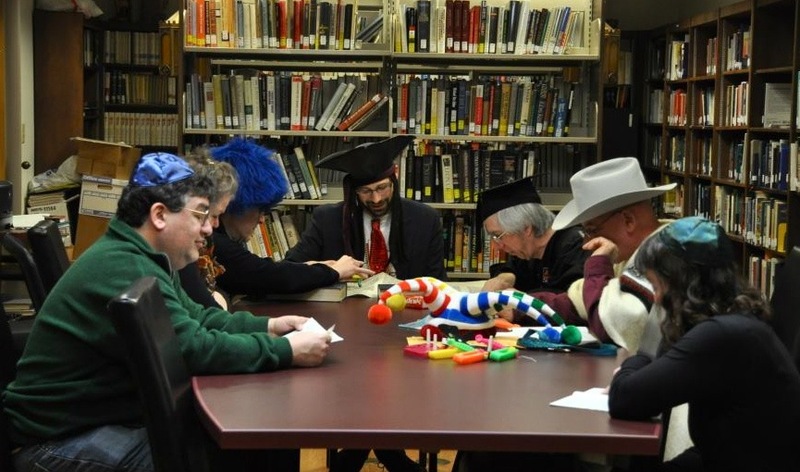 Education is at the center of what we do at Ohavay Zion Synagogue. We offer programs and activities for young children at our Gan Shalom preschool, a religious school for children from age 4 through b’nai mitzvah, educational activities for junior high and high school students, and a range of programs for adults. Since 1998, Gan Shalom, Ohavay Zion Synagogue’s early childhood program, has been offering Lexington families an intimate, nurturing environment, making the first school experience an overwhelmingly positive one. Our primary goal is to provide quality care and education. We are STARS-rated and offer children ages 12 months through 5 years a stimulating, age-appropriate setting that supports and prepares them for a life-long love of learning. For more information, see the Gan Shalom webpage: http://www.ganshalom.com/ or contact the director, Amy Howe, at director@ganshalom.com or by telephone at 859-335-9922. Students at Ohavay Zion Synagogue lead Friday night services, read Torah and Haftarah, give a sermon, and lead the Torah and Musaf services. They have mentors who spend time with them working on their Hebrew skills, and they each have the opportunity to study one on one with Rabbi Smolkin. Over the course of the years preparing for their Bat or Bar Mitzvah, students not only learn the prayers, but feel and experience the joy of Jewish worship. They develop as people and learn how to be leaders in their community. They shift from being children to being adults, with all the responsibilities that entails. Midrashah challenges adolescents as they think about what Judaism can mean for their lives. They discuss and explore, watch movies and videos, cook a variety of Jewish foods, do social action projects, and go on field trips to other places of worship. Midrashah is a wonderful way for our Jewish adolescents to continue their Jewish journey. When students enter college, they are expected to have learned certain basics of secular knowledge. They should know Algebra, have an understanding of United States History, and be familiar with some of Shakespeare’s works. Universities want out children to have a base of knowledge from which to continue their educational journey. At Ohavay Zion Synagogue, we want to provide our students with a similarly strong Jewish base. Jewish College Prep (JCP) is a rotating three year curriculum for 10th through 12th graders. Now that they are older, our students can understand Judaism on a more mature level. They can delve into our traditional texts, exploring Bible, Talmud, and Jewish Mysticism. JCP provides an incredible opportunity for our teenagers as they progress into Jewish adulthood. OZS offers a wide variety of continuing and short-term classes and educational activities, formal and informal. See our calendar for the current schedule. For more information, contact the office.